It’s almost Christmas and I wanted to create a tiny design that anyone can make. This little polar bear is super special. He is tiny and adorable and comes with his very own… Hmm… I think I will keep that a secret until next week. NOTE: This pattern is designed by Diana Moore from PINK MOUSE BOUTIQUE. This pattern is available for free only on my blog pinkmouseboutique.com. If you see the pattern and pictures posted on another website, please let me know. Thank you! 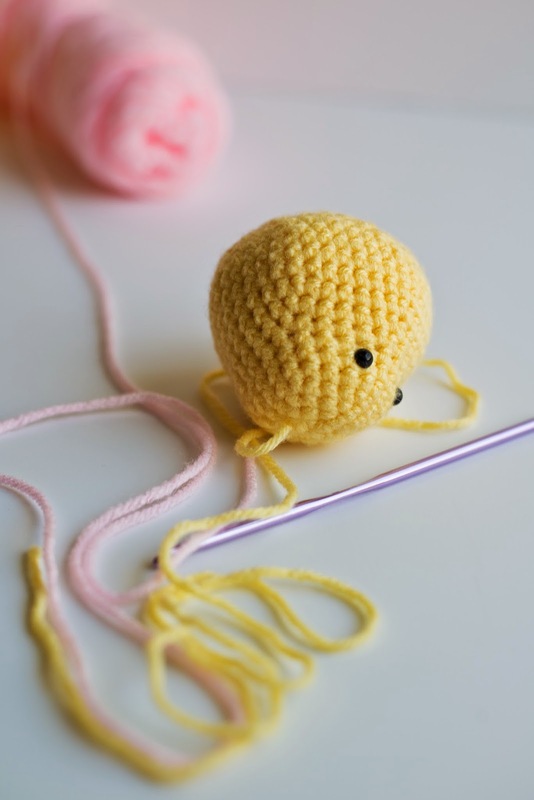 Crochet in continuous rounds unless otherwise specified. Use the invisible decrease technique when decreasing. We will begin by making the head, body, and legs (in one piece). Stuff the head and body well. The legs will be made with 9 sts on each side of the body. The 6 sts (3 in the front and 3 in the back will be sewn later). Continue from where you stopped with the body. Leave a long tail and fasten off. Leave 6 sts in the middle for sewing (3 in the back and 3 in the front of the body). 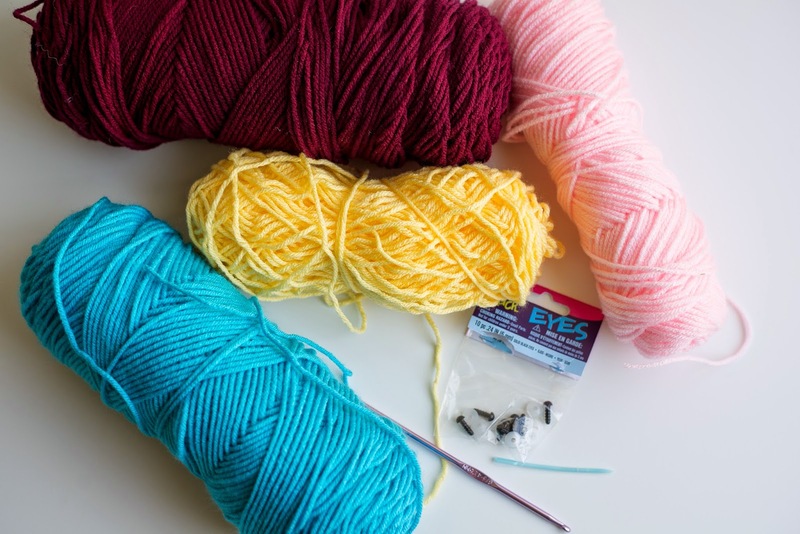 Join yarn to one of the 9 sts you left for the 2nd leg. Continue following the instructions for the first leg. Once you finish both legs, stuff them well, finish them off and secure the stitches. Sew the eyes on Round 5, 5 stitches apart. Sew the nose in the middle 3 stitches between the eyes. Then sew one long line starting from the middle of the nose and going down 2 rounds. Use red yarn or any color of your choice. Sew the arms on Round 8 (or 9) of the body. Sew the tail in the back a round above the legs. Sew the ears on top of the head (a round below the magic ring). Using a cotton swab and blush, make pink cheeks. NOTE: Cover the body with a piece of fabric so the blush doesn’t stain it. Fold the scarf in half and find the middle. With the glue gun, glue the middle of the scarf to the front of the bear (Round 9). You will wrap it around a few times while gluing in a few places to make sure the scarf will stay in place. Note: Add only a little bit of glue at a time so it doesn’t look messy. Tuck both ends under the scarf and glue to secure. Optional: Sew a small snowflake to the scarf (a little to one side). Stay tuned! In a few days, this little guy will show you something special! My daughter loves birds. So, for her birthday party, I made seven crochet birds – one for each of her guests. The kiddos loved them. My daughter likes to put hers in a little basket and walk around the house. I should make more because these cuties are perfect for a child to hold and great for learning colors or counting. Use the invisible decrease technique. Crochet with the right side out. Leave a long tail (you’ll make feathers later). Pull yarn to close the mr. Put the eyes on round 7. Leave 3 sts between them. Do not secure the stitches just yet. First, we will make the feathers on top of the head. The feathers are made on top of the head of the bird. I made three feathers using the long tail I left before starting the magic ring. Insert hook anywhere you want on top of the head (I keep it close to where the tail starts), YO, pull and sl st. Now make a ch of 6 or 7 (this is the smaller feather). Insert hook in same st you started, YO, pull and sl st. Make a ch of 10 or 11 (bigger feather). Insert hook where you started, YO, pull and sl st. Fasten off. You can make the feathers longer by making longer chains. You’ll make the beak a row below the eyes in the 3 sts between them. I start by making an outline (a little triangle). After you make the outline, you can keep sewing until you fill in the beak. I usually sew right in the middle (from the bottom of beak until very top). And voila! 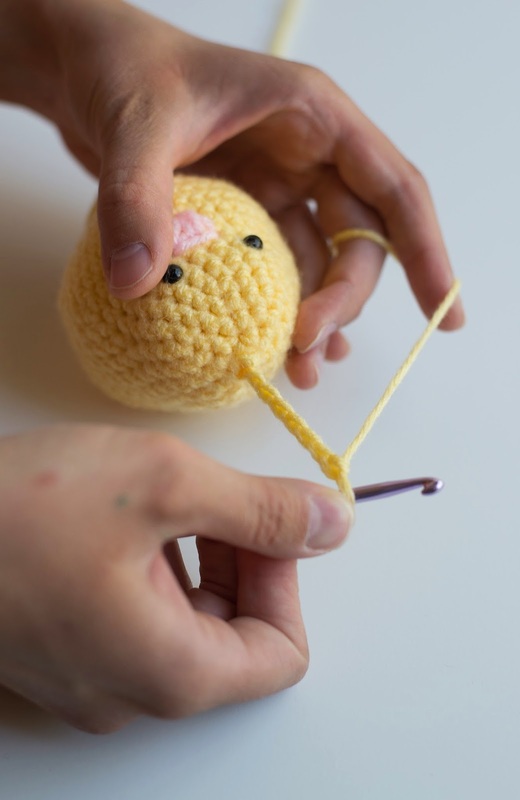 You have a cute little crochet bird. I hope you like this pattern. It’s the very first one I ever made. Pictures were taken by my very talented friend Kristen Willden.